Editor’s Note: Would you like to quit your job to follow in Anthony Bourdain’s footsteps? Traveling around the world, experiencing local, authentic food, and getting paid to do it? If that’s the lifestyle you dream of, Claire and Rosemary’s Freedom Plan success story is a must-read. Claire grew up in France and moved to the US to work. Rosemary grew up in Kenya and moved to the U.S. to pursue her university education. They met in Chicago in 2008 where they were both working in corporate careers. In 2015, they traded in their corporate jobs to eat their way around the world. 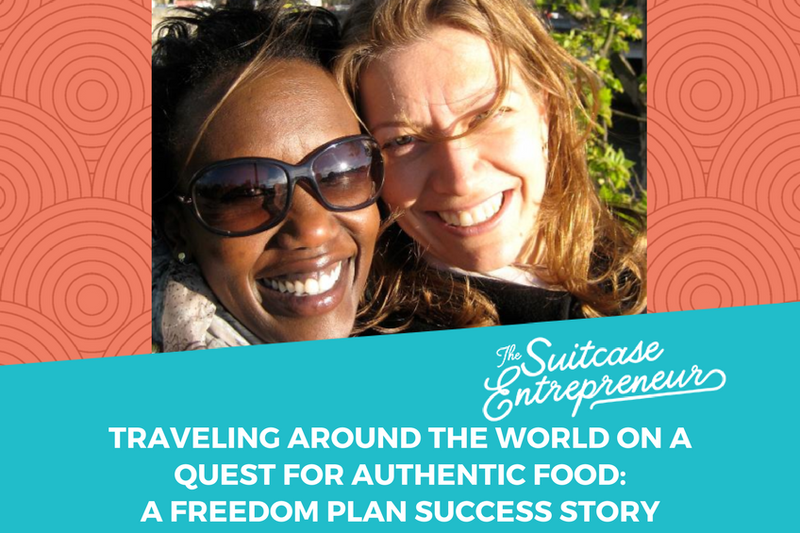 Today, they are partners in life, and co-founders of Authentic Food Quest, a business which wants to build more meaningful connections between the local people and travelers by means of traveling through food. Here’s their story, in their own words. After years of working in the corporate world, we had reached a point where we were each seeking more — a higher purpose and more meaning. This angst sparked the conversation to “take back control” of our lives and create our own career path forward, rather than let a company “dictate” how we should live our lives. We were tired of the 9 to 5 and internal politics and started doing some serious soul searching about how we wanted to live our lives. Then two unforeseen events pushed us forward. Claire lost her dad, who committed suicide at the beginning of 2015. This made us assess our purpose while recognizing that life is short and needs to be lived fully. Soon after, Claire’s position was suppressed. That is when we decided to take a leap of faith and start our own venture. So, in the spring of 2015, we left behind the stability of our corporate jobs and normal life in Los Angeles, California, and walked into the “uncertainty” of becoming digital nomads. In the next five months, we built our website, started our business, sold our possessions to become nomadic, and left for Argentina. While this may sound like a radical shift, it was actually the realization of a long-term goal. The dream to start our own business was something we had been talking about for a couple of years. We wanted independence (from our corporate jobs) and the opportunity to lead our own projects. We didn’t have a precise idea about what to do until we started reading about online and location independent entrepreneurship. But then we read The 4 Hour Workweek by Tim Ferriss and realized that it was possible to be location independent and earn a living. The idea of not being fixed to a particular location, and the possibility to travel around the world with a purpose was like a dream come true. So we started searching for and reading inspirational stories of people who had become digital nomads. And that’s when we discovered Natalie Sisson and were instantly drawn to her personality. Natalie’s personal story struck a chord with us. Reading her book, The Suitcase Entrepreneur, we were inspired by her experience and her career which was similar to ours — living the expat life in a high paying corporate job. The fact that she didn’t start with a large investment or a very definite idea encouraged us to pursue our dreams. We loved her bold moves and approach to finding freedom. At that time, Natalie was offering her Freedom Plan™ program, and we decided to join it. Unfortunately, we were too late as the enrollment period had just closed. Though not long after, Natalie offered a DIY version and we jumped on the opportunity to join. We have enjoyed her videos and modules that are packed with tips and action-oriented exercises. Even after 12 months, we continue to use her material to shape our business and product ideas. The Freedom Plan™ program and community have helped us not only on a practical level but in changing our mindset and believing in the possibility of a nomadic lifestyle. When we first created our business, we were quite overwhelmed with what we needed to accomplish and realized that we needed to have guidelines and a framework from someone who had successfully done it before. Using Natalie’s framework to find our sweet spot, we combined our love for food and passion for travel (what we love to do), with our strategic and organizational skills (what we are good at), and play in the 150 billion food tourism industry (what someone will pay you to do). We created Authentic Food Quest with the mission to inspire people to travel through authentic food. We believe that by traveling through food, people have more meaningful connections with the local people, food, and culture. To build the website, we worked in partnership with Kasia Zukowska, a web developer, and another Freedom Plan success story. We launched our website at the end of June and left for Argentina on August 4th, 2015. Over the next six months, we traveled “slow” and visited Argentina, Uruguay, Chile, and Peru. We spent our time discovering the authentic foods of the region; met locals, tasted unique dishes and flavors and wrote about our experiences on our website. Our goal was simple, by discovering and showcasing the traditional and local dishes, travelers to the region would have deeper and richer experiences, through food — authentic food. After six months of traveling across South America, we returned to the U.S. and became house sitters for the first time. We wanted to find space and time and to create our first product. So that’s when we decided to write a book, the first of a series, about the authentic dishes we discovered in Argentina. 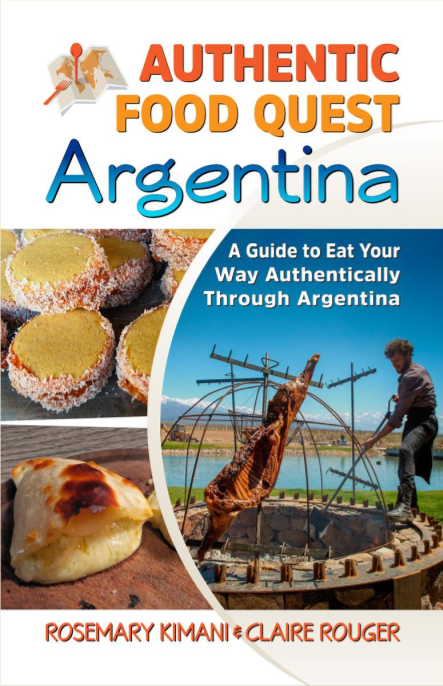 In the next seven months, we wrote, edited, and published a Kindle and a paperback version of Authentic Food Quest Argentina: A Guide to Eat Your Way Authentically Through Argentina. The book is available on Amazon and Barnes and Noble. This scrumptious guide takes all the hassle out of doing all the research about Argentine cuisine and gives travelers the tools and information to create their own culinary adventures. In the guide are stories about local restaurants and dining adventures, the markets to visit, the unique produce to sample, travel tips and how to get the most authentic experience around the country. The guide invites travelers to open up to new tastes and flavors and have a deeper connection and travel experience in Argentina. Writing the book took a lot of hard work. We learned a lot about the writing process, the publishing process, and the on-going book marketing. In spite of all the challenges and difficulties we faced, we are proud of our first book. So far, the response to the guide has been very positive. Readers have enjoyed the easy to follow format, the range of foods highlighted — from street foods to traditional dishes and unique produce, as well as the markets and restaurants to sample the delicacies. We are currently selling equal numbers of the Kindle and paperback versions. Although, our initial idea was to launch only the Kindle version, which is convenient for travelers to download and carry. But after the Kindle version came out in July, we started receiving frequent requests for a paperback version. This led to the creation of the paperback book, which came out in September. Despite the move to digital products, we have learned that there is still a fair amount of people who still prefer holding a copy of a book in their hands. From South America, our quest took us to Southeast Asia. We spent six months exploring the authentic dishes of the Philippines, Thailand, Vietnam, Laos, Cambodia, and Malaysia. We are currently telling the stories of our discoveries at authenticfoodquest.com. Head over and see the latest discoveries and must eat local dishes in the region. This is year two of Authentic Food Quest, and we find ourselves energized and confident about the possibilities. We will continue to add to add to our book series, and at the same time, come up with additional products and services. Our vision is to see the business evolve to become a sort of “resource-platform” where Authentic Food Quest becomes a “one-stop-shop” for finding and enjoying local and authentic food experiences while traveling. We are working on developing partnerships with brands, food tour companies, cooking classes, restaurants that focus more on local experiences. In addition to the books, we are testing customized self-guided food trails. Building an engaged audience an ongoing priority for us. Feedback from our audience will help us develop the right products and services for foodies or culinary travelers. If you love local food and travel, we invite you to join the quest for authentic food. For any entrepreneur thinking about pursuing a digital or nomadic lifestyle, we would encourage you to build a “plan” and consider all options before taking the leap. Traveling and working on the road can be tiring and is not always as glamorous as it is sometimes portrayed. Claire and Rosemary built their dream lifestyle and business by combining their love for food and passion for travel (what they love to do), with their strategic and organizational skills (what they are good at), and decided to play in the 150 billion food tourism industry (what someone will pay them to do). If you too want a roadmap you can use to break free from the daily grind of your job, and create a business and lifestyle that you love, get on the Freedom Plan™ VIP list for more details.